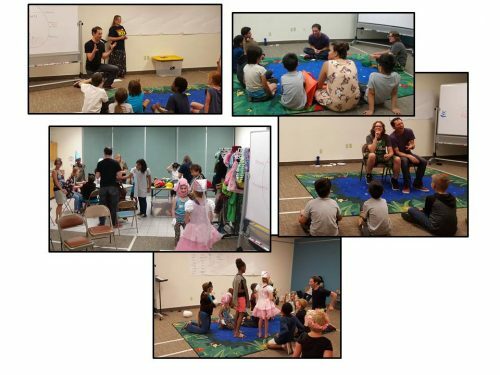 The Silver City Public Library hosted two workshops for children and teens facilitated by Santa Fe Opera teaching artist Charles Gamble during our summer reading program. On Wednesday, June 14, Gamble led children to create and stage an original story following the Hero’s Journey, a pattern that many myths, folktales, and even movies follow. The hero leaves home on a quest for something that is missing, meeting new friends and encountering dramatic obstacles and fierce adversaries on the way. Before returning home, the hero is dramatically transformed. Children planned the story with the help of Gamble and a few adult family members and library staff. Library staff and volunteers assisted with some simple costumes and makeup, and then the children brought their story to life in a whirlwind world premiere. The story they designed was about two princesses, sisters whose grouchy stepmother unfairly forced them to pursue only “ladylike” activities like braiding their hair. The princesses wanted to learn how to ride horses and fight, and to go on adventures. One night they escaped their castle and went on a dangerous adventure to find the Sword of Freedom, which would allow them to pursue their dreams. They encountered several obstacles along the way, including a crafty fox, a pack of hungry gnomes, and a bridge over a rushing river guarded by an ogre. We all appreciated the creativity and enthusiasm of the group of participants as they presented their tale to us! On Thursday, June 15, Gamble offered a workshop on theatrical improvisation geared toward older children/teens. The workshop focused on techniques to nurture students’ innate curiosity, creativity, and ability to make connections with others. Participants practiced high-end listening, a skill needed for telling a story collaboratively. For example, in one of the exercises Gamble and one teenager sat next to each other and pretended to be a pair of conjoined twins. The pair would speak by taking turns, each saying one word at a time to complete sentences. It was an exercise in on-the-fly improvisation, each participant having to think quickly to choose a word that would make the sentence logical—and sometimes funny! The Silver City Public Library can be found at silvercitypubliclibrary.org, and you can contact us at 575-538-3672 or ref@silvercitymail.com.